The city of Aleppo, in northwestern Syria, is becoming an incredible human tragedy. Russian and Syrian bombs continue to devastate the eastern, rebel-held part of the city. They have targeted non-combatants in hospitals, bread lines at bakeries, and civilian neighborhoods. The United Nations and many of its member nations are calling this a war crime. Yet it goes on and will likely continue. Why can’t someone stop it? What are our options in Aleppo? In 2011 during the Arab spring, protestors demanded that Syria’s President Bashar al Assad step down. He responded with violence. The conflict escalated to civil war. 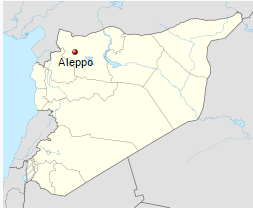 Aleppo, Syria’s largest city, with over 2 million people, became the rebels’ center of operations. Since then, various groups from within and outside of the country have supported one side or the other. The latest and most important of them is Russia, which adds its air power on the side of the Syrian government. ISIS’ presence in Syria complicates this picture. For now it is sitting on the sidelines watching the other parties destroy each other. It hopes that the country will be so weakened that it will be able to step into the power vacuum. Why has Russia invested so heavily at this time in Syria? To understand this one must grasp Vladimir Putin’s political situation. Russia’s economy is in ruins. Ordinary Russians suffer hardships every day. Some blame this on an oligarchy which is enriching itself at the expense of the people. To distract them from their hardships Putin has skillfully stirred up nationalistic pride. He hopes that thinking of Russia as a world power again will distract people from their suffering. Putin’s first success along these lines took place in Ukraine in 2014. The Russian economy was already disastrous. Yet after seizing Crimea and getting away with it, his popularity among Russians soared. Since that game is working he is looking for places to continue it. Syria is a good opportunity. If he can make Assad a Russian puppet, he will continue to bolster Russian pride and keep his country’s attention diverted. Sorry to say, there is a good chance that he will succeed. Aleppo is a particularly strategic target. Russia hopes to help the Syrian government crush the opposition there. That would keep Assad in power. However, Putin may learn that propping up a failing state involves more than he bargained for. Even if Assad prevails, opposition to his regime will not die down. The devastated country will be unmanageable. Putin may find himself dragged into that quagmire. But for now, he needs to keep the game going. Some short-term victories will have to do. So what should the US policy be? How much, if at all, should we get involved? What are the geopolitical and security implications for us? What about humanitarian concerns for the agony of Aleppo’s citizens? Some have suggested that we go after ISIS in Syria. This would not help Aleppo, where ISIS is not a main combatant. The Free Syrian Army (the rebels) and the regime’s armed forces are the main actors. But some people think this might be a good time to deal ISIS a blow. However, any direct action against ISIS by the USA would be difficult. ISIS embeds itself in cities. Actions to dislodge them would produce many civilian casualties and collateral damage. 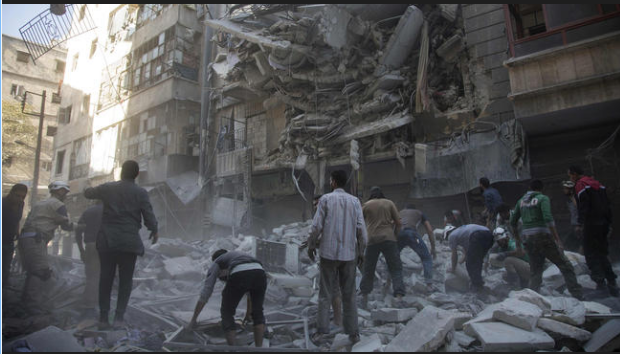 It would look like the devastation in Aleppo as Assad tries to dislodge the embedded rebels there. In our day of asymmetric warfare there are few battle lines. Combatants mix in with vulnerable civilian populations. The Syrians might end up hating us for the damage we cause more than they hate ISIS. It is one thing for a country to take such action to drive an intruder out of its own streets. Iraqis now are taking such action against ISIS in Mosul. It is far different when an outsider causes that kind of destruction. As a result, we need to stop thinking that we as outsiders can easily win urban street wars without making things worse. Another possibility would be to support the rebels more. But as we saw in Egypt, this doesn’t work as long as the rebels are not united. The seven or more groups of rebels in Syria agree only on their opposition to Assad. Many doubt that they could put in place a stable government. Even more serious, although they started out as a movement of democratic protest, most now embrace Islamist philosophies. Some have ties to Al Qaida. None want democracy. Their victory would put another radical Islamist government in power. Of course, this would not satisfy ISIS. They would immediately oppose it, claiming their Caliphate to be the more legitimate government. One way or another, an Islamist regime would replace Assad. Is this a good outcome? Another option is to declare a no-fly zone over that part of Syria where there is inhumane bombing. Former Secretary of State Hillary Clinton has recommended this. It would feel good to take action of this sort. Situations sometimes exist in which military actions can relieve some humanitarian disasters. An example is when the USA was able to rescue the Yazidis in Iraq because of its unopposed air power. This seemed reasonable. Iraq had no objections to our rescuing innocent civilians. We should do such things where we can. It would set a bad precedent. By what authority do we enforce our will in Syria against its will? Russia is operating there with Syria’s permission. We would not be. Rather, we told the world that Russian intervention in sovereign Ukraine was wrong. Syria and Russia would have every right to object to our intervention in Aleppo. It would legitimize others’ interventions in sovereign states. It is a dangerous strategy. Why would Russian respect such a declaration? This is not a good time to “play chicken” with Russia. Putin and Assad are two bullies who have to continue their course to stay in power. They cannot afford to back down. Such people are apt to do dangerous things both to others and to themselves. Do we want to risk a shooting war with Russian airplanes? We should already have learned in Iraq and Afghanistan that well-intended actions do not always bring about good results. And for what purpose? There are no strategic reasons for us to do so. Fortunately, President Obama has resisted it. Remaining outside the fray seems the wisest course. It seems as though the best way to put pressure on Putin is through economic sanctions at home. His failing economy is what has prompted Putin’s international belligerence in the first place. At some point he will no longer be able to ignore Russia’s desperate economic situation. People will see through Putin’s bullying scheme and demand economic reform at home. Even Putin cannot withstand economic collapse forever. In addition, might world outcry have any effect on the indiscriminate bombing? Not on the short term. The threat to Assad is personal and existential. He is not going to heed exhortations to be a little more humane. Putin is fighting for a kind of glory that he needs in order to survive at home. Neither is particularly concerned with the opinions of the rest of the world. However, both will at some point need to do business with other countries. Other nations who view them as war criminals may be slow to enter into alliances or trade deals with them. Behavior like that of Russia and Syria does not go without penalty on the world stage. Furthermore, even if Assad wipes out Aleppo and its rebels, his job will not be secure for a long time. The World Court could indeed try Assad as a war criminal if he doesn’t manage to stay in power. The outcome of that trial would not be pleasant for him. We can leverage our relationships with other nations to assure that the world does not forget what Assad and Putin have done. We could aid groups like the White Helmets or other groups that believe they can bring needed aid to Aleppo. It seems worthwhile to encourage and supply them. “Here, there’s an opportunity for the U.S. to be bold — in a massive mobilization, organized as quickly as hurricane or earthquake relief that could bring aid to suffering civilians. “Line up the relief convoys at the Turkish, Jordanian and Lebanese borders and dare the Russians to stop them. Air-drop supplies to a besieged, desperate city. Let the world see what Russia’s brutal policies have brought. These are inadequate, imperfect options, but they’re surely better than doing nothing. I wish Mr. Ignatius were right. Doing something is not always better than doing nothing. Assad’s and Putin’s goals are clear. Assad and Putin clearly intend to make life impossible in Aleppo. Denying basic human necessities is part of their war strategy. Given this, they would likely attack any humanitarian interventions by any outside power. Neither airplanes dropping supplies nor relief convoys would be safe. Do we want to get into a shooting war with Russia over a country that will never be our ally? This could become a quagmire like that which we got into in Iraq and Afghanistan. The costs both in human life and treasure could be huge, with small chance of changing the fate of Aleppo. Without outside intervention, the most likely outcome will be that Russia and Syria will prevail and take the city. However, this may prove more of a headache to Russia than a benefit. They will face a massive rebuilding process, into which Russia would be drawn at great expense. It is theoretically possible that the Islamic insurgents in east Aleppo might somehow prevail. That is looking increasingly unlikely. Another outcome is also possible. Estimates say that rebels in Syria number “about 100,000, including fighters from the al-Qaida affiliate Jabhat al-Nusra.” They could scatter and become a guerilla force, continuing to harass the government. They might continue to be supported by Assad’s enemies, Turkey, Jordan, and Saudi Arabia. That could in time become a big enough problem for Putin that he might abandon his support for Assad. That, in turn, could lead to even more chaos as the country’s various power centers struggle for control of the country. Finally, who knows at what point ISIS might decide to join the battle? When we evaluate the alternatives in any foreign intervention, there are three fundamental questions we should always ask. What is our strategic interest? What can be achieved and at what cost? Given that we would like to promote democracy and do humanitarian aid, is there a likely chance that they are achievable in a given situation? The answers in Aleppo seem to be the following. The only four possible outcomes in Syria are (a) a victory for the oppressive current government, (b) a victory for Islamist insurgents, (c) victory for ISIS, or (d) a prolonged period of chaos. All pose similar security threats to the United States, but none directly impact the USA. We don’t have a big strategic interest in the outcome. Any intervention will be extremely costly and none of the outcomes mentioned seem worth the cost. There is no chance for democracy to emerge in Syria in the foreseeable future. We do not have a strategy to get Syria and Russia to stop their bombing before Aleppo surrenders. Without that, humanitarian aid will merely delay the inevitable. As mentioned above, . We should find ways to support the work of the “White Helmets,” Syrians doing rescue work right in Aleppo. Financial support from outsiders would not put them in any additional danger, and might not entrap the outsiders themselves in the war. In addition, we can and should open our arms to any Syrian refugees that may escape the Aleppo disaster. Once they are out of the area they are of no more interest to the combatants. That would be far less costly and less risky to us than attempting to intervene in Aleppo. From a humanitarian standpoint, that may be just as desperately needed. But that is all that we may be able to do. Sometimes there is no simple solution to such political and humanitarian crises. That is the sad lesson of Aleppo. This entry was posted in What's New and tagged Aleppo, Aleppo tragedy, Assad, humanitarian aid, No-Fly Zone, options in Aleppo, Putin, Russian bombing, Syrian rebels, war crime, White Helmets. Bookmark the permalink.